The disadvantage of this is that you have to perform two queries, one to check the existence of the record and one either to update or to insert it. Is there something like upsert in Core Data? Yes! I discovered it recently. I had to import a bunch of quotes from a JSON file. Each quote has an author property. One author, with the same name, can have more than one quote. But the JSON file was a simple array of quotes. Without upsert I’d end up with many authors with the same name. How to solve this? 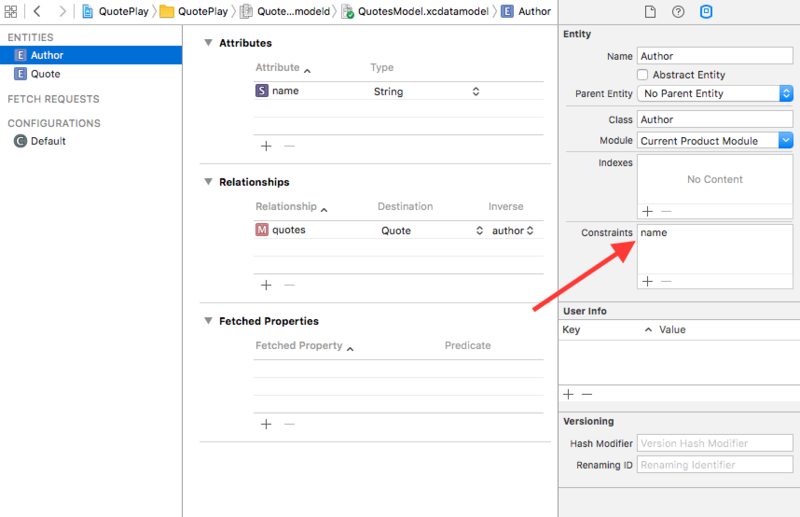 First you create a constraint on the name attribute. Second you specify the TrumpMergePolicy in the Core Data context. UPDATE: 2016/04/08 Obviously you should use an id field to guarantee uniqueness, but this method allows me to detect if there are trailing spaces in names or (even worse) authors with two different names, like “Steve Jobs” and “Steven P. Jobs”. Thanks to @Socraz6 for pointing out that this works only in iOS9.